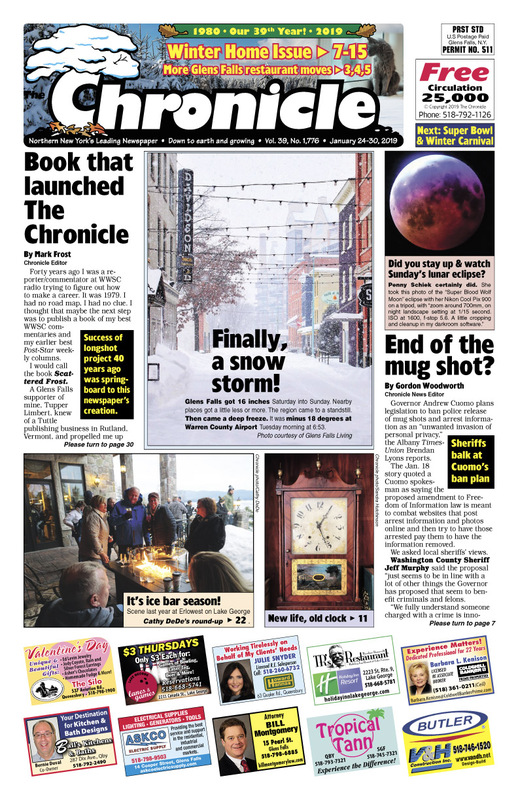 Winter Home issue | Finally, big snow! Scattered Frost led to Chronicle. Cuomo’s push to ban mug shots. Sandy’s 1820 clock. ‘gaslight’ restaurant nears opening. [farmacy] Restobar to open in former Gold Star location. David Johnson puts GF Dango’s, 3 more for sale. Moreau’s Kusnierz to seek re-election. Schermerhorn hopes to build 100 townhouses off Sisson Rd. Onslaught of ice bars! Ice fisherman catches and releases mink. Concerts, comedy, shows… The Chronicle always has the region’s best Arts & Entertainment section! Next: End of the mug shot?